The stations WVIZ/PBS, 90.3 WCPN and WCLV 104.9 broadcast to the citizens of Northeast Ohio and its various communities. 90.3 WCPN has added a new dimension to its digital broadcast. Along with hearing 90.3 WCPN on 90.3 HD1, you can now enjoy Northeast Ohio's classical music station WCLV 104.9 ideastream on 90.3 HD2. If you and/or your car is equipped with an HD (hybrid digital) radio, you'll appreciate WCLV 104.9's increased reception area. This content is all available free if your radio is HD. The new digital Thompson repeater was put on the air in late December of 2011. 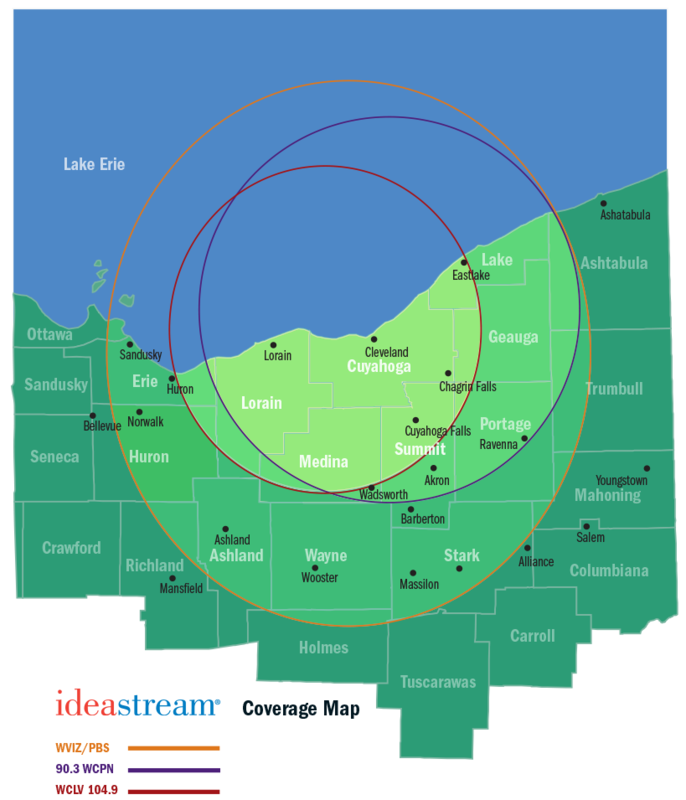 In 2018 and 2019, the Federal Communications Commission (FCC) is requiring WVIZ/PBS to change the television frequency of its Thompson repeater which serves several counties east of Cleveland. The households that will be affected are located in areas of Ashtabula, eastern Cuyahoga, Geauga, Lake and Trumbull counties. Find more information about changes to the Thompson repeater.